The airgunner on the picture is Major David G. Bellemere and behind him is the B-24 Liberator heavy bomber ‘Tepee Time Gal’. 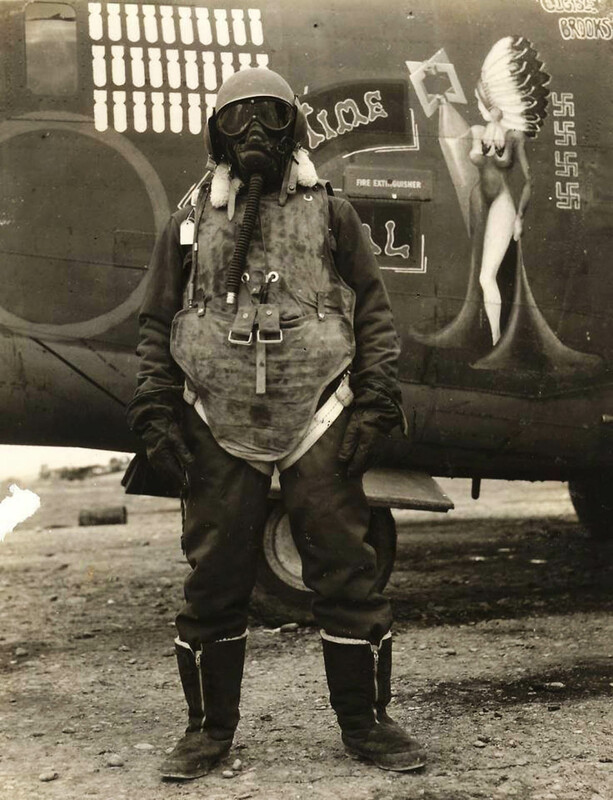 He’s wearing the typical flight clothing: M4 flak helmet with Polaroid B-8 goggles, flak jacket, F-2 electrical flying suit with B-3 jacket, A-14 oxygen mask, the gloves and ugg airmen boots. Swastikas inscribed on the plane’s body represent number of German planes shot down (so-called kill counts). Bombs represent number of missions flown (so-called bombing run). Crews frequently got attached to their aircraft, as they are not only flying them but continually repairing and maintaining them. Additionally, it is one of the things they were allowed to personalize. More importantly, the plane was what carried them away from death and back to the safety of their airfield. The work you put into the maintenance and care for the plane is a culmination of the will you have to live on and survive. Aircraft would eventually be lost, outdated or scrapped due to maintenance cost and replaced. Aircrews in World War II decorated their planes with pictures of pinups and pretty girls. This kind of art was called “nose art“. It was (and still is) an interesting practice. While begun for practical reasons of identifying friendly units, the practice evolved to express the individuality often constrained by the uniformity of the military, to evoke memories of home and peacetime life, and as a kind of psychological protection against the stresses of war and the probability of death. Some see a deep, psychological impulse – attaching a talisman, a good-luck charm, to the aircraft as a way of warding off evil, death, and bullets. The beautiful Indian girl painted on the above photograph was named Wattacrok. In 1942, during the first three months of America’s combat flights over Europe the average bomber crew was expected to complete 8-12 missions before being shot down or disabled. This in mind, the US Army Air Force decided that 25 missions would constitute a “completed tour of duty” because of the “physical and mental strain on the crew”. The 25 missions was a number crews could believe in, and provided some hope of a light at the end of the tunnel, particularly necessary with the grim statistics bomber crews faced early-on, before long-range fighter escorts significantly improved mission survivability when they arrived later on in the course of the conflict. This 25 missions rule does seem kind of strange because an infantryman was in until he was killed, injured or somebody won. Surviving 25 missions was pretty rare, so to inherit such a plane was considered extremely lucky. The new crew could always tell the new airplanes from the old ones because they were warmer. On the old ones the seals around the turrets would eventually wear out and let the cold in. My father and most bomber crews flew 52 missions in 1944 wile he was shot down 3 times. He was a navigator / bombardier flying a Martin Marauder . Oh my, that sounds incredible. Can't imagine how it felt, my respects for him. Of course, over time that '25 mission' limit was extended further & further. The effects on morale were considerable, as may well be imagined, given the projected mortality rates applicable to aircrew. This effect is well illustrated in such WW2 epic films as '12 O'Clock High', 'Catch-22', 'The War Lover', and others of that genre. It also helps to recall that the Allied bombing campaign, carried out under Air Marshall 'Bomber Harris', and which targeted innocent civilian population centers indiscriminately, was ultimately shown to NOT have shaken the German resolve to resist and it did not directly contribute towards hastening the war's end, as had been anticipated (this fact has been documented quite well by any number of post-war USAF Air College studies and it has also been begrudgingly acknowledged by RAF historians, well after the fact). All that said, ALL war is hell, and yet the insanity of war continues unabated today, as each new youthful generation seeks in it a chance to prove themselves in war. It helps to remember that while young men fight wars, they are conceived, planned and organised by much older men. No better example of the inherent carnage and slaughter of war exists than the willingness of the British high command (Haig, et al) to sacrifice hundreds of thousands of soldiers in absolutely futile, suicidal assaults on machine-gun equipped enemy lines in the First World War. That detachment from any vestige of reality, plus the newly introduced use of highly accurate heavy artillery, resulted in massive casualties that stagger the imagination. All of the above is simply further incentive to study history and gain some historical understanding of exactly why wars (all mass conflicts, fought with devastating modern weaponry) are ultimately total insanity and must be avoided at all costs. Given that more and more nations now possess nuclear weapons and intercontinental delivery systems, the danger has never been greater. "ABOUT THE FLAK Suit and the Story ! "Sammy" Seymour Gaines /crew Member, VIA son Jim O'Boyle, Jr."